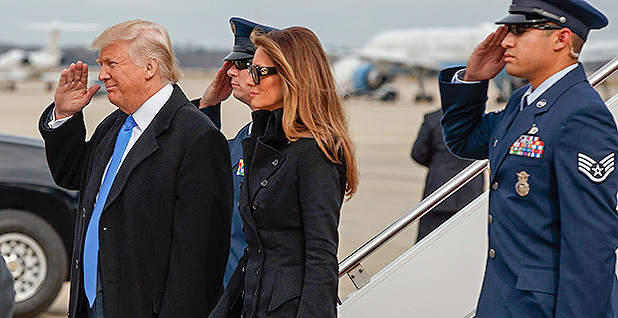 President-elect Donald Trump salutes as he and his wife, Melania, arrive at Andrews Air Force Base yesterday. Photo courtesy of AP Images. A cavalcade of limousines and marchers is ready to usher Donald Trump to 1600 Pennsylvania Ave. this afternoon as the 45th president, in a highly secured procession where every minute detail has been scoped and scripted. But the currents of energy and economic actions that will follow Trump's inauguration won't resemble today's clockwork plans, based on the new president's guerilla campaign tactics and the unpredictability of energy markets and politics, policy analysts say. Since the end of World War II, "there has never been such an outsider coming into the presidency," said John Glaser, associate director of foreign policy studies at the Cato Institute. "It's truly very unpredictable. Unsettlingly unpredictable." Trump will inherit the leadership of a nation that is becoming the Western Hemisphere's Saudi Arabia, according to the International Energy Agency, shipping crude oil, gasoline, natural gas and petroleum products to foreign customers in ever greater volumes, while shrinking the oil imports that weighed down trade balances for a generation. "The big change in U.S. energy markets that will punctuate the next quarter-century is the shift from an orientation of being a customer to being a supplier," said Kevin Book, managing director of ClearView Energy Partners. At the same time that the new administration hails a U.S. fossil fuel resurgence, it has signaled a retreat from international collaboration on cutting greenhouse gas emissions to combat climate change, an about-face from America's posture under President Obama with unknowable consequences. Trump backed his promise to scuttle the Obama administration's Clean Power Plan with the nomination of Oklahoma Attorney General Scott Pruitt (R), an outspoken foe of the plan, to head U.S. EPA. Pruitt told senators at his confirmation hearing this week that he would put the agency in its "proper" role as a partner with the states on clean air and water issues, removing its "heavy hand" under Obama (E&E Daily, Jan. 18). Trump advisers are also calling for the new administration to pull back from EPA's stepped-up fuel economy targets for cars and light trucks, another cornerstone of the Obama climate plan. EPA got the ruling out this month, accelerating its decision and drawing protests from U.S. automakers. Former Texas Gov. Rick Perry (R), Trump's nominee to head the Department of Energy, told senators yesterday that he had spoken with the president-elect, adding, "He truly is an all-of-the-above supporter of American energy." Perry pointed to his home state as a model, with its leading position as a supplier of oil, natural gas and wind power. Speaking carefully to promise senators an all-of-the-above policy platform, Perry indicated he sees a distinction between supporting government research and development on new renewable energy technologies, versus continued backing of federal subsidies for renewable power. "I'm a fiscal conservative and I don't back away from that. I think that is a badge I wear with honor," he told the Senate Energy and Natural Resources Committee members at his confirmation hearing. "You can't change the stripes on this zebra." That keeps Perry in line with Trump's endorsement of fossil fuels production and skepticism about federal support for clean energy options. "The federal government should get out of the way" of energy production, Trump said in an energy speech last year (E&E News PM, May 26, 2016). Trump joins Republican leaders in Congress favoring more oil and gas leasing on federal lands and a green light for pipeline expansion, notes Barclays analyst Warren Russell. U.S. oil producers are preparing another domestic investment surge after weathering the price collapse in 2014. New pipeline links are likely to double gas shipments to Mexico by the end of the decade, and a first wave of liquefied natural gas (LNG) export terminals will be completed by 2018, with more to follow, according to analysts at RBN Energy. Trump "is very focused on jobs, the creation of good, high-wage jobs," said Jason Bennett, co-head of the Global Projects Group at the Baker Botts law firm in Houston, and that goal ties into support for a major investment in infrastructure spending of all kinds, including on energy. The new administration will look for ways to boost gas pipelines, Bennett predicted, putting a focus on the delivery of gas to LNG export terminals and gas-fired power plants, which has replaced coal as the dominant fuel for generation. But energy markets can't be told to fall in step with energy policy, noted Jonathan Levy, a former DOE deputy chief of staff. A queue of proposed LNG export terminals needs to be acted on by the agency, for example. "Some of the rhetoric from Republicans in Congress, and industry, is that they should all be approved," he said. "Then the question is, what does the market do in response?" The path ahead looks far more rocky for the new president's campaign mantra of increasing high-wage U.S. jobs by raising obstacles to foreign imports. Trump will face a push by House Speaker Paul Ryan (R-Wis.) for wholesale tax reform, including a border tax adjustment that is part of the Ryan "Better Way" blueprint advanced in outline form last year. Under the Ryan blueprint, companies that import foreign components for their products could no longer deduct import costs from taxable income. That provision, coupled with the plan's other key provisions, would effectively raise costs of these imports by 25 percent, says economist Philip Verleger Jr. Automobiles, electronics and other imported items would take the hit, Verleger added in a paper published by the Brattle Group. "No sector, though, will be more affected than petroleum," he said. The border tax would not apply to U.S. exporters of crude oil and hydrocarbon products, but imports would be. Notwithstanding the surge in U.S. oil output from shale and tight rock formations, "the U.S. is and will remain a net importer of petroleum for the foreseeable future in certain regions," Verleger said, naming the East and West coasts and the Upper Midwest. U.S. refiners could sell diesel, gasoline or jet fuel abroad without tax liability under the blueprint, but imported energy would be subject to a 20 percent tax on revenues. That would raise the price ceiling enjoyed by U.S. producers, Verleger said, a rich windfall and a reason for Trump's oil-sector allies to press for his support. ClearView's Book, writing about the border tax plan, noted Trump's coolness to the Ryan plan. "Too complicated," Trump told The Wall Street Journal. In order to take the pain out of higher import prices on consumers, the value of the dollar would have to increase commensurately. Economists can make that prediction, but getting economists' support isn't the same thing as rounding up political backing, he added. While tax cuts are a priority for Ryan and Senate Majority Leader Mitch McConnell (R-Ky.), political analysts expect tax reforms to fall behind a repeal of the Affordable Care Act, a confirmation fight over Trump's first Supreme Court nominee and raising the federal debt ceiling. And that doesn't include unpredictable machinations in U.S. relations with Russia, China and Iran. Trump nominees to lead the CIA and the departments of Defense, Homeland Security and State broke ranks with headline-grabbing pledges in Trump's campaign speeches. Nothing is less clear than how Trump will move U.S. policy in the Middle East, where decisions inside OPEC still drive world oil prices. Levy asks how can outsiders square Trump campaign rhetoric and recent social media bursts with contrary statements by his nominees. "It's hard to read any of the tea leaves," he said. Book said logic argues against a conflict that could cause a major energy price shock. Saudi Arabia and Iran may be locked in a fraught struggle for regional dominance, but they have every reason not to let it get out of hand, he said. "Nobody wants to put their economic wherewithal at risk by starting an oil war unless they absolutely have to," he said. Another Trump promise — to throw coal states an economic lifeline — becomes harder to achieve as the administration promises to open more federal land for oil and gas leases and build more infrastructure, helping restrain price increases on coal's power plant rival, natural gas. Some industry leaders don't see a renaissance of coal-generated power despite Trump's rhetoric. "For those miners, get ready because you're going to be working your asses off!" he told a rally last summer. But Robert Murray, CEO of Murray Energy Corp., a leading coal producer, said it was too late to restore job losses caused by EPA rules and cheap natural gas. "I've suggested to Mr. Trump that he temper his expectations," Murray told CNNMoney. With EPA sidelined on carbon policy, the states will move even more decisively to determine their energy futures based on their resources, economic priorities and politics. "States will do what they have always done: organize their industrial capacity and resources nature has provided them to optimize their economies," Book said. "That is history." "What's driving this change has nothing to do with Trump and has nothing to do with state regulators. It has everything to do with customers and technology," said Tom Fanning, CEO of Southern Co. and chairman of the Edison Electric Institute, representing investor-owned electric utilities. Blue states will generally seek more renewable power and more customer-owned energy. Red states will lean the other way, but with exceptions (Energywire, Dec. 19, 2016). But while some directions seem clear under Trump, many analysts' assessments are made with crossed fingers and a pinch of salt over the shoulder. Imagine that Trump decides that DOE rulings on more LNG exports to Europe should be linked unofficially to the U.S. allies' support of NATO. Want more LNG? How much are you paying for NATO? Imagine that a proposed border tax plan that would hit hard at foreign carmakers is before Congress. Would a Trump administration try to use that to get more investment in U.S. car plants — then wrap the regulation of vehicle gasoline mileage into the bargain? Will the issue of U.S. military assistance to Saudi Arabia and the United Arab Emirates be merged with discussion about a change in OPEC production quotas that could raise oil prices and put more U.S. oil and gas companies back in the money? In short, will Trump, who threw away the political playbook in capturing the Republican Party and the White House, do the same for energy and environmental policy, creating never-before-seen negotiating strategies across policy silos? Perhaps only Trump could answer those questions now, but be ready for something very different, said Barry Worthington, executive of the U.S. Energy Association, a bipartisan energy research group. "I think Trump is going to come at every aspect of governing as a negotiation, whether it is dealing with Congress, foreign leaders or inside his own administration," Worthington said. Book cautioned that Trump will find it harder to negotiate around energy than real estate. "The portfolio of executive authority is vast, but jumbled," he said. "Different things move at different speeds. A president can't necessarily trade things like border adjustment for CAFE," he said, referring to the corporate average fuel economy standard. "That doesn't mean a Trump administration won't try," he added. Try, Trump will, the experts are betting. Everything about his astonishing ascendancy last year suggests he will write his own script for energy policy, with more unpredictable, unconventional moves and personal engagement, and the first pages will be turning soon.